Books, puzzles, computer games and more for $1! You can get books for just a $1...or less! PHOENIX — What can you get for a buck? I have a whole list of things, and some will be even cheaper at the VNSA Used Book Sale this weekend. You'll find more than half a million used books, puzzles, computer games and all sorts of other media at the annual sale. 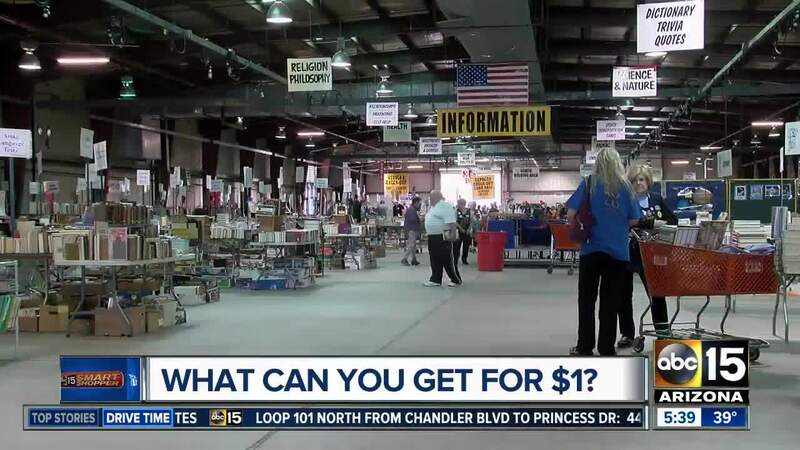 It's the 63rd year and it's happening Saturday at the Arizona State Fairgrounds, from 8 a.m. to 6 p.m., and Sunday from 8 a.m. to 4 p.m.
Then on Sunday, everything is half price, dropping the starting price to 50 cents. That's unbelievable! There are a few exclusions in the rare and unusual category, but it's still a fantastic bargain. So, it's a win-win, great prices and great causes! Proceeds from the sale stay local, benefiting the Literacy Volunteers of Maricopa Country and the Arizona Friends of Foster Children Foundation. It's free to get in, but you do have to pay for parking, and that'll cost you eight dollars.